Current release version is 3.09! 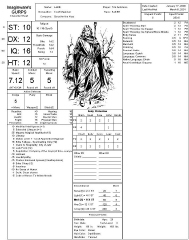 The best Character Generator for Steve Jackson's GURPS system keeps getting better!! Check out all the latest changes in the "What's New" area! To see all the source books currently included with the GURPS Character Generator check out our "What's Included?" page. As always, we welcome the criticism and ideas of all our loyal fans. It is through these suggestions and ideas that the GURPS players out there have that our software can keep getting better!! Thanks to all those who have let us hear what it is they want in a character generator. Together we can create the best generator possible!